When you design an InfoPath 2003 or InfoPath 2007 from an existing schema. The namespace of the schema is going to be hardcoded inside the manifest.xsf of the XSN package. There is very litle you can do to change this namespace. This namespace will be the one that is always going to be sent across when you submit the form to a web service. The namespace will be stored in the xmlns:ns1= node. 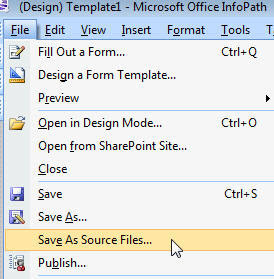 In InfoPath 2007: Select File, then select Save as Source Files. Select a directory where you will like to put those files and click on the OK button to execute it. 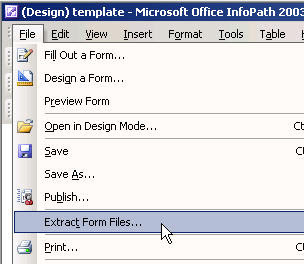 In InfoPath 2003: Select File, then select Extract Form Files.... 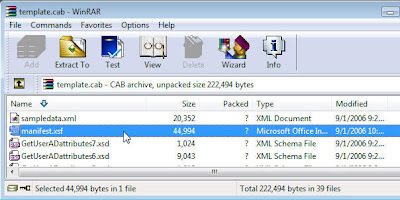 Select a directory where you will extract the source files and click on the OK button. In each directory you will find a bunch of files. The one we are after is the manifest.xsf. This manifest is the one that has the namespace hardcoded into it. However, there is not an easy way to change the manifest and then put it back into the InfoPath Template. A little trick to try is to change the extension of the template. For instance, if the Infopath template name is Template.XSN, you can change it to Template.CAB. ;) Thanks Monish for this tip.! Now you can see all of the files inside the CAB archive. You can extract the manifest file out of it and change it, then put it back into the archive. Rename file back to XSN, and you will be done. !